It is a state-of-the-art diagnostic method, which was developed and patented by IGENOMIX after more than 10 years of research. This technique evaluates the status of the endometrial receptivity in the molecular point of view. The ERA is a personalized genetic test to diagnose the state of endometrial receptivity in the window of implantation. The endometrial receptivity is the status in which the endometrium is ready for embryo implantation to take place. This occurs around days 19-21 in each menstrual cycle of a fertile woman. Until now, the only study done on the endometrium was an ultrasound scan, and there was no any other analysis method available. The ERA test allows us to diagnose whether the endometrium is receptive or not by analyzing the expression of a group of genes related to endometrial receptivity. For that, an endometrial biopsy must be performed at P+5 (hormone replacement therapy cycle) or at LH+7 (natural cycle), and after its shipment to our installations, the expression of 238 genes is analyzed. RNA obtained from an endometrial tissue sample is hybridized in a custom micro-array with probes for those genes. After hybridization, a computational predictor classifies the sample as receptive or non-receptive according to its specific expression profile. The result from the test will determine if a woman is receptive or not in the day and kind of cycle in which the biopsy has been performed. If she is receptive, it means that her window of implantation is placed in the day in which the biopsy was performed and therefore the blastocyst could implant during this day and kind of cycle. A non-receptive result could imply a displaced window of implantation. Therefore, a second biopsy would be needed in order to validate this displacement. A specific day for the second biopsy will be suggested according with the first result obtained. This will allow the implantation in a subsequent cycle with a Personalized Embryo Transfer (pET). 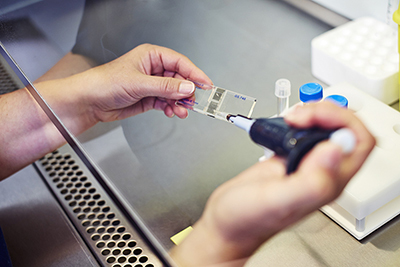 This test has been tested in patients who have had implantation failure with embryos of good morphological quality (at least 3 failed embryo transfers for younger women or two in patients 37 years or more). This test is recommended for patients with apparently normal uterus and with normal endometrial thickness (≤6mm), in which no problems are apparent. 1. Being a receptivity endometrial diagnostic method, the ERA determines the personalized window of implantation for each patient before to begin an assisted reproductive treatment. 2. The ERA test has shown high sensitivity and specificity detecting gene expression profiles associated with receptivity. For HRT patients on the 5th day from the start of progesterone.